Posted on Sat, Nov 12, 2011 : 6:16 a.m.
his Oct. 3, 2011 photo shows chicken cordon bleu rollups in Concord, N.H. These rolls make an excellent packed lunch and take only about 20 minutes to prepare. When it comes to finding ways to reduce fat and calories, I favor reinventing a classic recipe rather starting from scratch. And many times, that's all it takes. For example, just a little innovation was all that was needed to reinvent an old classic like chicken cordon bleu. Traditionally, this recipe is made from a chicken breast that is pounded flat, wrapped around a filling of ham and cheese, then dipped in breadcrumbs and sauteed in butter. Translation — eat too much of it, and you'll have to call in a search-and-rescue team to find your bones. Here is a much easier interpretation — with fewer calories and less fat, sodium and cholesterol. And healthful doesn't mean tasteless. This recipe tastes delicious, even though I swapped out several fattening ingredients. For example, I replaced the butter with small amounts of cholesterol-free olive oil. The ham and cheese are lower-fat versions, and light whole-wheat bread takes the place of higher-carb breading. Voila! Now chicken cordon bleu can be declared a health food. I designed this recipe so your kids can get involved in the preparation and cooking, too. So turn off the TV and turn on the stove. Let the kids do the flattening, stacking and rolling, while you do the actual cooking (which involves only a little microwaving and sauteing). The process will pique their interest in helping out in the kitchen. The recipe, by the way, takes only 20 minutes — perfect for short attention spans. The kids will love the melted cheese in the center, and you'll love the fat and calories you save. Traditional versions of this dish can have as many as 780 calories and 32 grams of fat per serving. Mine has just 231 calories and less than 4 grams of fat. I've added a quick-to-fix side dish, too. 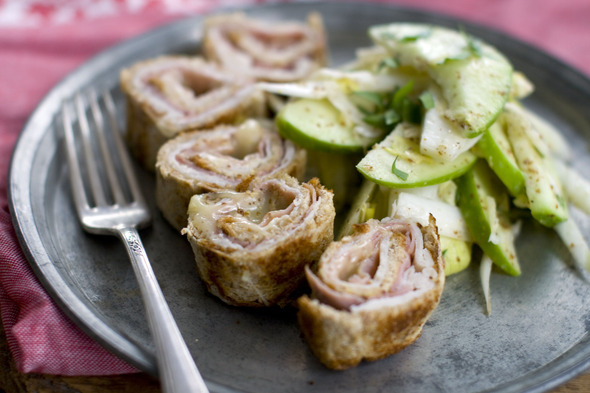 My fat-free endive, apple, vinegar and tarragon salad is the perfect accompaniment to the chicken cordon bleu. — These rolls can be cooled, re-wrapped in parchment paper and chilled. To serve, heat in the microwave for 1 to 2 minutes on medium (50 percent power), or until heated through and the cheese has melted. They make an excellent packed lunch. Lay 2 slices of the bread on a clean work surface. Overlap the curved tops of the bread slices by 1 inch. Use a rolling pin to flatten the bread slices into very thin rectangles, adding extra pressure to the overlapped area. Repeat with remaining bread slices to make 4 total rectangles. Top the bread rectangles evenly with sliced chicken, then the ham, being sure to cover the surface of the bread evenly with each addition. Divide 1 tablespoon of the mustard between the rollups, spreading it evenly over the ham. Stack 4 strips of cheese lengthwise along one short end of each rollup. Roll each up like a carpet, making it as tight as possible. Once it is rolled, wrap each roll tightly with a piece of parchment paper. Place the rolls on a microwave-safe plate and microwave on high until warmed through, 1 to 2 minutes. Meanwhile, spray a large nonstick skillet with cooking spray and place over medium-high heat. Unwrap each roll and place in the pan. Cook for 4 to 5 minutes, or until browned, rolling them around to brown evenly. In a large bowl, mix the remaining 1 tablespoon of mustard, the vinegar and tarragon. Add the endive and apple slices and toss to coat. Season with salt and pepper, then divide between 4 serving plates. Once cheese is coming out the sides of the rolls and the bread is browned, place the rollups on a cutting board. Cut each roll into 4 to 6 pieces and divide the pieces evenly among the plates. Nutrition information per serving (values are rounded to the nearest whole number): 231 calories; 4 g fat (15 percent of calories from fat; 2 g saturated); 33 mg cholesterol; 27 g carbohydrate; 23 g protein; 6 g fiber; 1,070 mg sodium. Sat, Nov 12, 2011 : 1:52 p.m.
Hard to foget how this guy treated his employees back on his reality show. He was a real jerk.